Having migraine, headache? 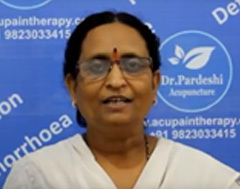 Get relief by acupuncture specialist without medicines by MD of 40 yrs of experience at modern 4.5 Star* rated clinic in Nashik. It’s without any side effects! This is one of many patients have been benefited by the efficacy of acupuncture in their Migraine Treatment. Head Pain is most common pain in body. Headache symptoms originate from the tissues and structures that surround the brain. Common origin of pain is either covering layer (meningeal) of brain, bones of skull, muscles that encase the skull, sinuses, eyes, and ears. Headache can also be from layer that cover the surface of the spinal cord; arteries, veins, and nerves. All these structures can become inflamed or irritated to cause the pain of a headache. The quality of pain may be a dull ache, sharp, throbbing, constant, mild, or intense. The brain itself has no nerves supply, therefore cannot give sensation of headache. 1. Primary headaches – can be tension headache, migraine headache or cluster headaches. Tension headaches are most common. Migraine is second most common headaches. Migraine headache are classified under primary headaches and are caused by enlargement of blood vessels in the brain. You should be able to recognize the potential triggers of migraine headaches especially if you are suffering from it on regular basis cluster headaches are rare. 2. Secondary headaches are headaches caused by primary pathology outside skull like hypertension, haemorrhage outside brain, trauma, or infections. What are types of headaches? If you are having dull headache sensation or vice like constriction that usually involved whole head or part of it is sign of tension headache. In tension headache symptoms, we might find pain on pressure in neck muscles in this type of head ache which may be really bad headache. You may have combination of both and may not be able to differentiate between two. Tension headache may present pain that start in the back of the head and upper neck and is described as a band-like tightness or pressure. It may extend to encircle the head and become severe headache. With most intense pressure may be felt over the temples or over the eyebrows and give frequent headaches. It may vary in intensity but usually is not disabling, allowing the sufferer may continue with daily activities. The pain usually is bilateral. It is not accompanied with an aura, nausea, vomiting, or sensitivity to light and sound. It occurs infrequently but can occur also daily in some people. It allows to functions in daily routine. Home remedies for headache depends upon causes of head pain. Unusual headache needs to be investigated by expert headache doctor. Chronic headache treatment also needs to be investigated by migraine expert or similar. However common headache can be treated at home. Massage at temples or back muscles make feel comfortable. Acetaminophen or paracetamol like headache medicine may be enough headache treatment. There can be medicine for headache in other therapies also like aurveda or homeopathy. Drinking enough fluids is essential. Running nose needs good humid air. Severe headache treatment needs expert headache doctor or migraine doctor. SinusitisCommon cold can culminate into sinus infection which causes the sinuses and nasal passages to become inflamed. Swelling of face is a common sign of this type of infection. Management of sinusitis especially viral origin with acupuncture surprisingly, give very quick relief. Signs of migraine are severe throbbing pulsing sensation head pain, usually one side of the head. It may be accompanied by extreme sensitivity to light and sound, nausea or vomiting. Attacks can last for hours to days and can be so severe that the pain is disabling. Migraine aura or warning symptoms of migraine pain may occur before or with the headache. These can be tingling on one side of the face or in your arm or leg, flashes of light or blind spots or ocular migraine. Migraines may follow through four stages though not necessary: prodrome, aura, headache and post-drome, frequently begin in childhood, adolescence or early adulthood. When considering migraine symptoms treatment, we must know that, in prodrome stage one may notice, constipation, mood changes, from depression to euphoria, food cravings, neck stiffness, increased thirst and urination or frequent yawning. Aura though not necessarily, may happen before or during attack. The symptoms can be visual disturbances of ocular migraine, such as flashes of light or wavy, zigzag vision. They can be also be as movement (motor) or speech (verbal) disturbances touching sensations (sensory). Muscles may get weak, or you may feel as though someone is touching you. They may last for 15 to 40 minutes. Attack lasts for few hours to few days. Post-drome stage occurs after attack and is accompanied by confusion, moodiness, dizziness, weakness or sensitivity to light and sound. Acupuncture relaxes muscular tension through the nervous system causing reduction the tension headache pain. Acupuncture reduces stress and regulates the body’s stress response which is basic cause of the tension headache. For symptoms of migraine and treatment, probable cause has to be evaluated. Acupuncture should be first migraine treatment plan in migraine management. It relieves pain by stimulating body to release natural analgesics like endorphins and enkephalins. Efficacy of acupuncture is confirmed by many studies as given below. Chronic migraine treatment depends how frequently you have migraine headache symptom and how long it lasts. There are no specific migraine treatment protocols because each case would may different. If you have migraine headaches, there are many treatment options for migraine treatment at home. Migraine medication can have some role in treatment. But remedies and therapies like acupuncture, don't use medication. Migraine headache remedies can include adequate sleep, smoking cessation, and avoiding any food and environmental triggers (for example, stress, flashing lights). If these don’t help migraine tablets can be taken for headache pain relief. Natural migraine treatment is said to be used by Baba Ramdev, Ayurveda migraine treatment centres. Here, natural migraine relief is claimed to be provided. Migraine treatment drugs here, are in form of herbs. Efficacy of such treatments is not confirmed. Migraine treatment in homeopathy in Hindi regions is also similar. There many types of treatment but none gives instant migraine relief or migraine cure. Patients report having taken Ayurvedic treatment for headache migraine pain and reported some relief. Similarly, Homeopathic treatment for headache migraine has also had some satisfied patients. Acupressure treatment for headache migraine has limited scope. Yoga treatment and for headache migraine pain, especially due to stress can be effective. Yoga involving sudden flexion, extension or rotation of neck can irritate nerve and exacerbate complaints. Similarly Tai Chi treatment for headache migraine pain is effective. Qigong treatment for headache migraine pain needs special training and can be useful tool of management. Respect warning signal of pain from body when doing exercises. Exercises must be slowly progressive. Sudden load on muscles or must be avoided. In cases of frequent or long lasting migraine headaches, preventive measures need to be taken, like avoiding trigger factors, regular eating and sleeping, and exercises for headache relief. Meditation has good effect on acute migraine treatment. Regular exercises give good tension headache relief. Headache pain relief can further be supported by creating migraine treatment group.